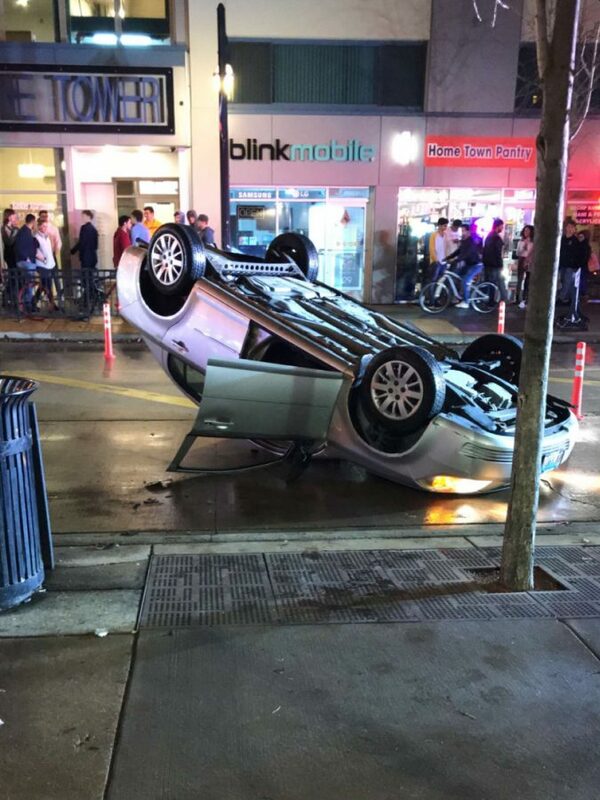 An overturned car on Green Street at 2 a.m. on Dec. 2. An arrest was made on the charge of driving under the influence after the Champaign Police Department was called early Sunday morning about a crash on Sixth and Green streets. Thomas Yelich, assistant to the police chief for community services for CPD, said police were called to a crash on South Sixth Street around 2 a.m. Sunday, but discovered an overturned vehicle. The victims had no serious injuries and did not go to the hospital, he said. Yelich said there were one passenger in the vehicle and CPD cannot elaborate on why the vehicle was overturned. Nick Carlson, senior in AHS, said he was sitting near the window with his friends at Legends, a bar and restaurant on Green Street, when the accident took place. Carlson said the police brought the driver, who seemed to have attempted to flee, over onto the sidewalk and into handcuffs. Although most restaurants were beginning to close, Carlson said the event attracted a huge crowd. Correction: A previous version of the article stated there were two passengers in the vehicle and misstated that CPD was unaware of why the vehicle was overturned. The Daily Illini regrets these errors.